"Everyone Should Learn Bicycle Rules"
Columbia has likely the largest bicycle education program in the United States, yet many bicyclists are not taking advantage of this opportunity. Most people — including many who ride regularly — think bicycling is so simple they have nothing to learn. The reality is few bicyclists understand how to ride safely in traffic or have even a basic understanding of bicycling laws. I've developed a short quiz for you to see whether you might have something to gain by taking a course. A. Move closer to the curb, even though you think you might hit the curb and crash? B. Maintain your position and hope drivers will begin to use more common sense and give you a wider clearance as they pass? C. Look behind you, signal and move left to the center of the lane when there is a gap, forcing drivers to look ahead for oncoming traffic, waiting for a clearing and then passing you in the other lane? The correct answer is "C." The law allows bicyclists to ride in the middle of a traffic lane if they think the lane is too narrow to share with another vehicle. 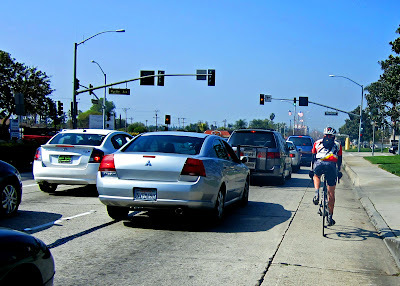 Many times bicyclists who complain of being passed too closely are guilty of inadvertently encouraging close passing by riding too far to the right when the lane is narrow. The driver, seeing a bicyclist hugging the right curb, takes that visual cue as an invitation to pass, even if the narrow lane width means it's too dangerous. Moving to the left takes away that visual cue. Traffic flow improves, and the bicyclists usually get far more clearance from the passing vehicles. Question 2: True or false — it's illegal for two bicyclists to ride side by side on a public roadway. The correct answer is: It depends. City Ordinance 14-503 says "bicyclists may ride abreast when not impeding other vehicles." That means that if traffic cannot pass only because the bicyclists are riding abreast, then they should move to single file. However, in most cases, traffic can easily pass by changing lanes, and the bicyclists are free to ride down the street side by side. A. Continue along the right side of the lane between the cars and the curb and make your way to the front? B. Look behind you, signal and then move left to the center of the lane to wait in line just like a motorist would? The correct answer is "B." Bicyclists who ride to the right side of stopped automobiles are vulnerable to a type of crash called a "right hook." This is where motorists making right turns strike a bicyclist who was passing them on their right side. By moving to the middle of the lane and waiting in the line of traffic, a bicyclist eliminates this threat. Then after crossing the intersection, the bicyclist can move back to the right side of the lane if it is safe. Several hundred adults have taken a bicycle education course in Columbia over the past six years. Every single student has learned a tremendous amount about bicycling, many even admitting they were surprised they learned so much.